Why do archaeologists think Roman coins are important? Roman coins are quite helpful for dating other finds in the same stratus or layer but can be misleading as Roman coins were used for a considerable time after they were minted. Because coins can tell us about changing economic and political conditions of the empire. We can find out who was emperor, and about inflation and the prices of goods. Because we can find out about the circulation of money. This may tell us where people settled, and the extent of trade and communication in the Roman world. The Romans were not the first to bring coinage to this country. It was in use by the Celts especially in the South East. One such coin known as a stater (50BC – 50AD) from the Corieltauvi tribe is on display at Middlewich Library, found in Warmingham. The Roman coins are sometimes likened to newspapers in the sense that the emperors publicised their victories on their coinage. They were also an attempt to inspire confidence with slogans such as Roman security’, ‘good health’ and ‘virtue’. A famous example is Felix Tempus Reparatia which means ‘restoration of good time’ or ‘happy days are here again’. Coins had to be mass-produced to satisfy the demands of the people throughout the empire. At the mints where the coins were made, molten metal was poured into moulds, producing a number of blanks at a time. These were then placed between two dies, which were hit with a heavy hammer. Around 20,000 coins could be struck from a single die. 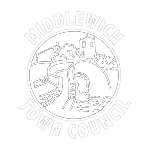 There is evidence to suggest that, at various times in the late 1st/early 2nd centuries both types of soldier were associated with Middlewich although not necessarily permanently stationed there. Basic pay = 300 Denarii a year paid in 4 instalments of 74 denarii (Stipendia) in January, April, July and October. However of each stipend 62 denarii were withheld to cover stoppages and debts of food, clothing and arms and to put some in the legion’s savings bank for retirement. The remainder (13 denarii) was given to the soldier as pocket money. Additional = Occasionally the state gave soldiers special bounties to commemorate things like the accession of a new emperor. Basic infantry pay = 100 denarii a year. As with the legionaries, broken down into stipends, with stoppages, savings etc. plus occasional bounties. Minerva who is depicted on one of the coins was taken up by the Celts. She metamorphoses into Britannia later and was on the British penny (written as 1d) up to decimalisation in 1971.